With the Timestone Internet Ordering system (IOS) the photographer is able to offer customers two different type of digital downloads. Not only is it possible for the customer to order their image or images as digital downloads but the photographer may also make any of their products available as digital products. 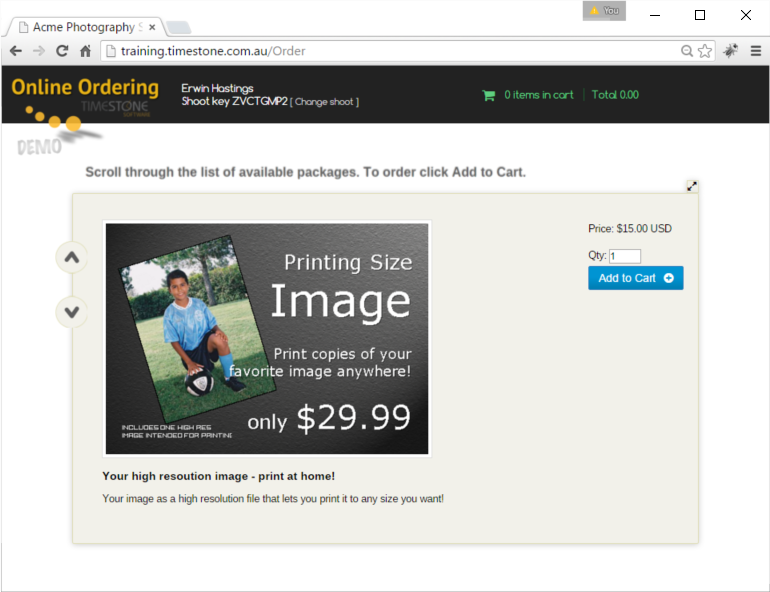 In order to make images available as digital downloads a product needs to be added to tsAdmininstrator with a product type of 'Digital Image". Multiple digital image products may be defined in order to offer the image at different sizes (resolutions). 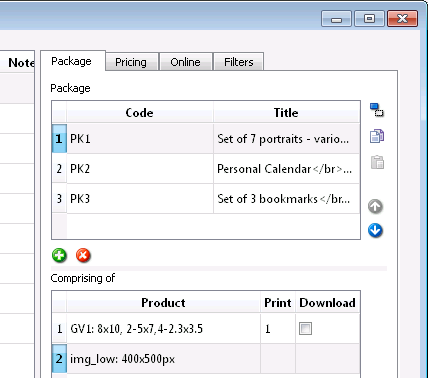 The screen grab below shows product definitions for three different digital image products each with a different size. It is possible to specify the size in pixels (width x height) of the digital image by using the 'Specialize' column. Once defined, the digital image product may be added to an offer in the normal way. It may be added to a package in combination with regular 'print' products or be a package on its own. If ordered, the customer receives the image as a jpeg in the pixel dimensions defined. Any product defined in tsAdministrator may be added to a package as a digital download. This is irrespective of it's product type - portrait, composite, group etc. This means any regular 'print' product may also be offered to the customer as a digital version. Furthermore it is possible to set the desired resolution of the product (dpi). To make a product available as a digital download .. The screen grab below shows the tsAdmin Offers object. 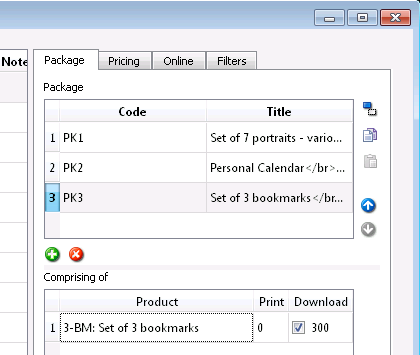 A bookmark product has been added to package PK3 and made available for download at 300dpi. The Print column is set to zero, indicating the product is for download only. The main advantage of offering the image in this manner as opposed to simply using the 'image' product type is the ability to use a customer version of the portrait template and hence more pleasing appearance than simply displaying the image.